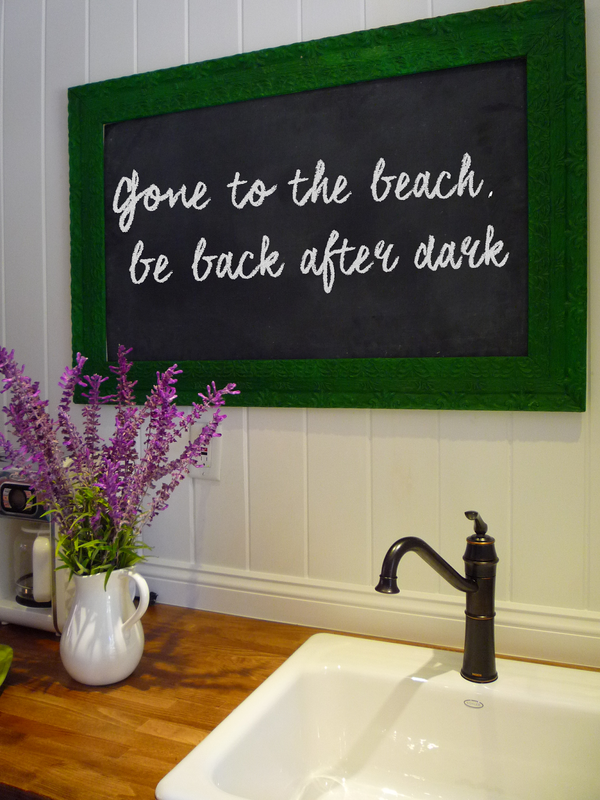 Today, I'm sharing our kitchen reno at the beach cottage. 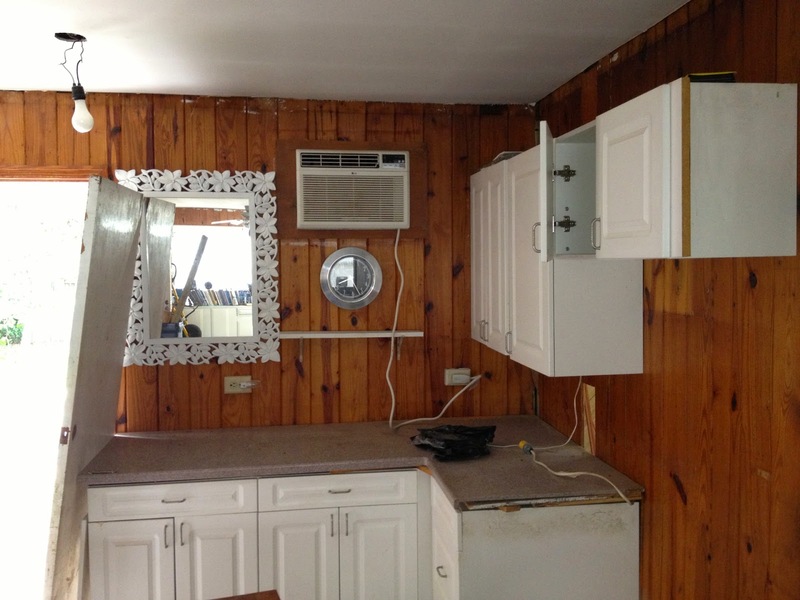 The before kitchen was obviously not the original 1955's kitchen and it was gross to say the least. 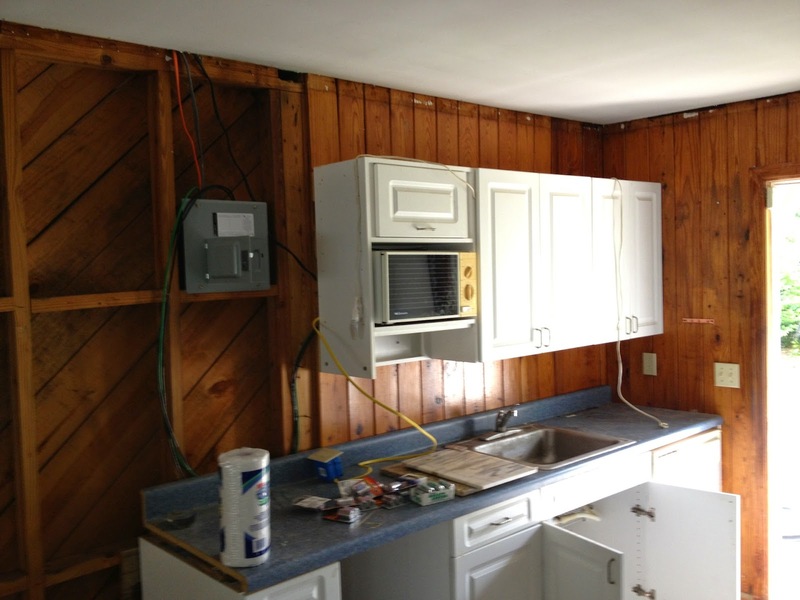 I think we removed in cabinets in record time because they were hardly secure and the counter-tops weren't even attached. We donated all of the cabinets and appliances. We saved space by using smaller appliances like a 24" dishwasher and smaller counter-depth fridge. I wanted open shelving rather than upper cabinets, the space is small so I didn't want to crowd it, plus adding shelving rather than cabinets saves a ton of money. The kitchen accessories are a mix of new and vintage, I made the fresh oysters sign from an old piece of wood that we found in the attic, I love how it turned out. In a later post I will show you how we used galvanized piping for the shelf supports. Stayed tuned for more info on beautiful counter tops. Looks wonderful! I love what you have done. We are currently painting our kitchen oak cabinets. They have really turned an orangey color over the past 8 yrs so we are painting them a driftwood grey to go with our Nordic coastal style. We are hoping to be done by Christmas! The kitchen looks amazing!! So filled with cottage charm! This is such a cozy and yet fresh kitchen. Pretty. Total transformation on your kitchen! I love everything you have done. Its so clean and fresh looking. The butcher block counter tops and green frame are my favorite elements of the space. I love your new kitchen! I adore those counters--exactly what I have always wanted! I can't wait to hear more about those! Trixie.... just beautiful. You aren't renting this cute place are you???? we are just planning our annual trip to the Fl gulf coast and are looking in that area.....this is in or near PCB, correct? I can't wait to see more about the counters. I want wood in my kitchen. Such a cute kitchen. So charming. 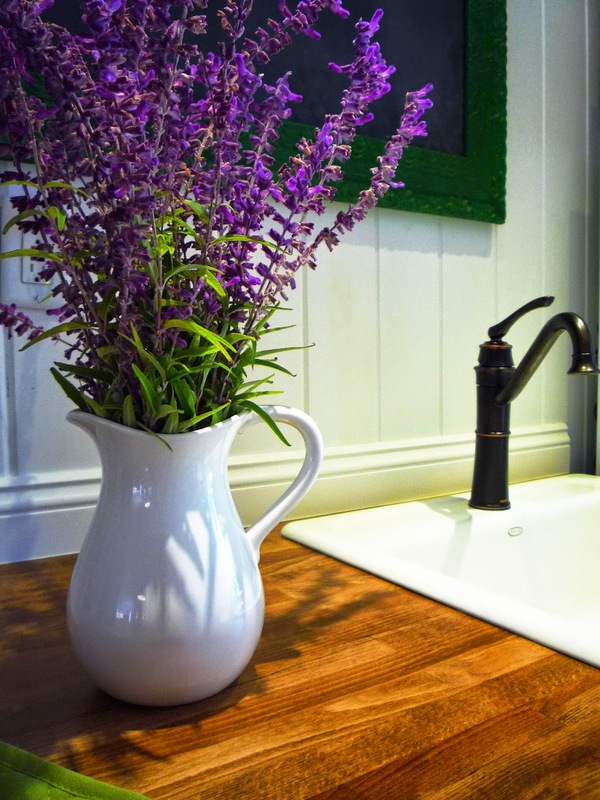 Would you mind sharing your sources for sink and butcher block? Can't wait to learn more about your shelves and brackets.